The Eamon II splash screen. 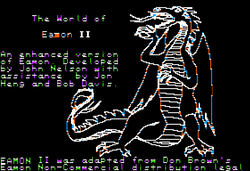 Eamon II (sometimes stylized Eamon ][) is an enhanced version of the Eamon game system created by John Nelson with assistance from Jon Heng and Bob Davis, released around 1982. The system adds additional commands, four new spells, several new artifact types, and a number of other refinements.